I don’t know, maybe it’s just me, but whenever I see this picture I hear Sheryl Crow. This is my Special Exposure Wednesday submission for 5 Minutes for Special Needs. Oh! And you can also find me guest-posting over at the KarenSugarPants site…she’s let me play in her sandbox. Weeee!! Oh, again! I forgot to tell you LAST week that I would be guest-posting over at Lit and Laundry…what can I say, I IZ tired, people! Posted in: Mayhew niblets, picture fun, special exposure wednesday, things our kids do. I see you are doing a lot of guest posting. Any interest in doing it again on my blog when I’m gone the week of the 24th? This is such a great picture. And I can hear Sheryl singing in the background too! I want to be in the sun with my floaters! Oh wait, I have floaters. They are just tucked away in my bra. Beautiful pic! You inspired me to share my own! Now I’ve got that song in my head — at least it’s a good song! 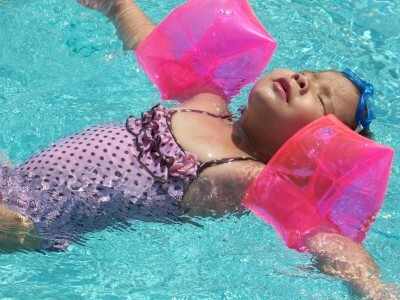 Fantastic picture – she looks so relaxed, she looks so Summer! You’re right, that song is perfect for that photo! What a perfect summer picture! Ahhh…to be a kid again! Great picture. I love her suit and her little pink floaties! What a cutie. Wish I were in the pool soaking up some sun right now! Oh! I hear the music, too. Great capture, mom. danettes last blog post..Learning to swing!